In the beginning of Hinduism vedic devas like Vishnu, Rudra and Agni were predominant. Later Rudra was superseded by Shiva, and the three cosmic trimurti-devas Shiva, Vishnu and Brahma of the tapo-loka became predominant. The triadic complement of the Trimurti is Tridevi with Sarasvati, Lakshmi and Parvati (Kali). According to the tantric Bahvricha Upanishad, the goddess Tripura Sundari is their creator. Brahma, the creator of the spiritual forms with 4 heads: Spiritual Earth Element. His Shakti is Sarasvati. Vishnu, the all-pervading : Evolution, preservation and destruction(divine electric and magnetic forces and poles, Vayu, Chit and Ananda). After a Nepalese relief he forms the bridge between heaven and earth. His transformed Ananda contributes to the Maya. His Shakti is Lakshmi. His riding animal (vahana) is the Garuda. 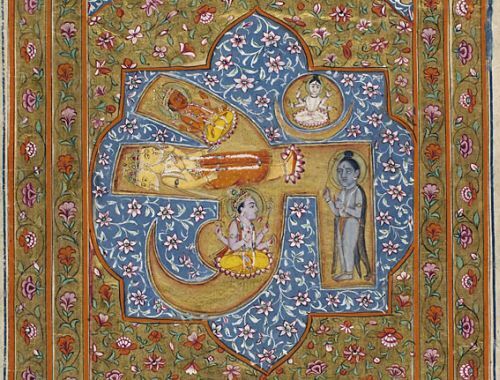 The 10 Mahavidyas represent a Shakta version of the Vishnu Avatars. Maheshvara, the great lord - ie. Shiva, 'the pure and unspoilt', less the crude than Rudra but more the dissolving destroyer, with the divine fire and ether. His wrathful aspect contributes to the Maya. His shaktis are Uma and Parvati(Mahamaya). Bhairava is his dynamic etheric aspect. According to the Kurma Purana, Shiva cut Brahma the 5th head off, because Brahma had proud designated himself as highest god. This is how Bhairava originated. 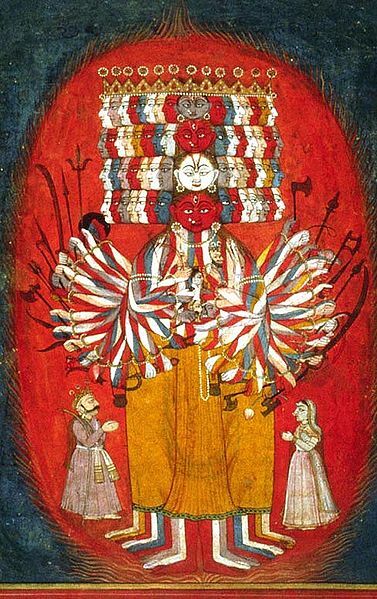 From the viewpoint of the Kashmiri Shivaism, the 'trimurti' are in the Ishvara Tattwa. In the Sat or Satyaloka (Parabrahman) above, resides the kashmir-shivaistic Sada-Shiva. It is unclear whether the Hindu Para-Shakti is comparable to its Shaktis. Hinduism is here at its limits. Dattatreya ('the three-fold gifted') is considered as an incarnation of the Trimurti (Drinuti Avatar). 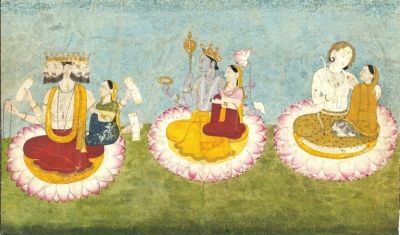 On pictures he is accompanied of a cow (Kamadhenu) and four dogs (~ 4 Vedas). He is regarded as singer of the Avadhuta-Gita, and he is mentioned in Mahabharata and Ramayana and in chapter 15 of the Markandeya Purana. Krishna in his alleged Form as Parambrahma(he is an incarnation of Vishnu...) exceeds according to the Bhagavata Purana the Omkara, and thus the "big emptiness" and the Tapa Loka, just like the cosmic mahashaktis (and like a master of the fifth initiation or step 20 of the universal path). The Bhagavad Gita uplifts him similarly high as parameshvara. Hinduism is regarding where Maha and Adi and Para are to settle somewhat undefined. In the books of Alice Bailey the Trimurti are assigned the three main rays of the seven combined rays. They have three rulers in the cosmic hierarchy. The three rulers for this universe are under the central ONE in the center of the universe.